Roffredo Caetani is not exactly a household name, but he was certainly one of the most interesting Italian composers active during the turn of the 20th century. Godson of Liszt and a pupil of Sgambati, his aristocratic origins allowed him, from childhood, to be in contact with some of the most eminent personalities of the cultural world of that period, meaning that he was able to keep up with the latest musical tendencies, adapting them to his own needs and personal style. A preference for gloomy atmospheres, rigorous use of polyphony and the relentless search for particularly daring and dissonant harmonies are just some of the traits to be found in Caetani's oeuvre. While the Ballad Op.9 is perhaps the most inspired of Caetani's works for the instrument, containing bold chromaticisms and numerous Wagnerian touches, the Four Impromptus are of a lighter and more intimate nature, most likely conceived for performance in the refined environment of the salon rather than in the concert hall. 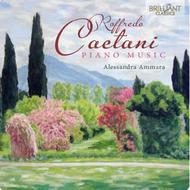 Also included on this set is a Toccata, the final piece making up Op.9 and which refers back to the Baroque repertory as well as to Schumann (to his Toccata Op.7), and the Sonata Op.3 - Caetani's most ambitious piece for piano, cyclic in nature and particularly affecting in its second movement, a vast canvas of melancholy and reflection. This is the first commercial recording dedicated to Roffredo Caetani's piano music, and many listeners may ask themselves why music of such quality and expressive power is not better known. One of the reasons is surely Caetani's reserved character and perhaps the dispassionate complexity underlying the interpretation and performance of his music also plays a role. Produced by the Fondazione Roffredo Caetani, this CD aims to do justice to a composer who is without doubt one of the most important representatives of Italian instrumental music at the end of the 19th century.